- - A - - B - -: New Jersey!!!! Yeeeehoooooo!!!!! While waiting for the others, we watched a futsal match between whoever-loser-1 vs whoever-loser-2 . Owh the match was a really brutal match laa... (Ade pergaduhan) hah.. so funny laa if there is a fight in a futsal/ football match. No sportsmanship!! !keh keh keh... Asilah came wit her cousins!!! (oww meN orang U.K..) so tall aaa each one of them. I managed to recall their names.. Nadia, Lisa and Sarah. Puan Junaidah was also here to support Asilah! Azim came a few minutes later... Lily and Gazi came late.!!! hurmm... Janji Melayu nieh! We had our lunch at two different places. Just drinking at Darul Ehsan section 9 and eating at Seri Bunga TTDI. 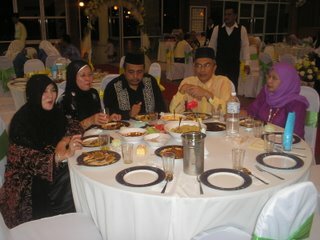 (Tak makan pape pon sebab pening... aiyyo). owh.. what a coincident!! Ilah met her secret admirer!! hehey.... budak kecik aaa~ Ilah Ilah~ Kerol called me around 3.30 p.m telling me that they were in front of Concorde Hotel Shah Alam. After finished eating, I quickly send Athirah and Ilah back home then straight to Darul Ehsan section 8! Kerol, Papa, Apis, Padi and Iji were there drinking by the time I arrived. They showed me those new jerseys!!! owh.. so nice laaa... soooo like jatuh-cinta-pandang-pertama-ngan-baju-baru!!! 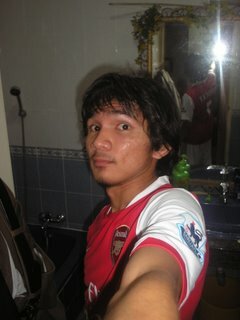 After trying and posing wit my new Jersey, I felt so tired and get some rest.. 6.30 p.m I got up and went to padang to play football.. hmm.. we lost! nevermind laaa.... I felt so happy today as I got my new jersey!!! 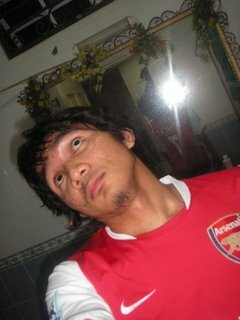 "FLY EMIRATES" cheywah~ "ROSICKY" huhuhuhu lagilah CHheywah!!! Night time. went to Ustazah Firdaus's Daughter's Wedding ceremony at Dewan Belia section 7!!! went there wit Mak. So many people and some familiar faces. I saw Iji's parents, Padi's, Amirah's, etc. FYI, Ustazah Firdaus was my "Ustazah Mengaji" back when I was in standard 2 until form 3!! lame kan??? hihihi... saaaaaaaaaayang Ustazah... Ustazah best!!! 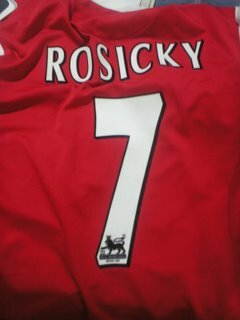 haha...best la ko dpt rosicky eh....apis suro byr cpat...bukan aku ckp tau,die ckp...ahaha....x sabar nk main ptg ni...baju baru kene 1 geng,baru cool dan bole mng...ronaldinho + rosicky + del pireo + shevchenko = attack 100(w E)....ahaha. alah,silap plak eja..del piero...nanti kerol cekik aku...ahaha.